After giving birth, many moms notice thinning hair. This is usually a shock to most, since most had thick, glorious hair while pregnant. Here are some of the latest products and techniques to regain your thick and healthy pre-pregnancy hair! While many women are aware that prenatal vitamins work to promote healthy hair and nails, once they give birth, they go back to taking regular vitamins. 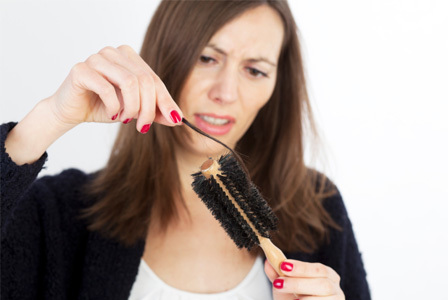 There are many formulations on the market now that contain ingredients such as biotin and silica. One to try is the new Viviscal Professional (pricing ranges from $70-$80 for a one-month supply) only found at your dermatologist, medical spa or salon. The professional formula contains a proprietary formula with a marine protein extract and scientific studies have shown 95 percent of users in trial research experienced hair growth and volume. A new breed of salon hair treatments has become popular for women with thinning hair. Kerastase has introduced Fusio-Dose (pricing varies per salon). In the salon, your stylist will determine what your hair needs (from nourishment, density, reinforcement or color protection). They will then custom blend a treatment for you in-salon to transform your hair. One to try is Kerastase Specifique 3-Step System ($135, kerastase-usa.com). The system contains a shampoo that helps remove product build-up from the scalp, an intensive scalp treatment that is applied and massaged at the roots of the hair daily and a thickening spray that texturizes the hair to create a thickening effect. Another product is Keranique ($100 for a 5-product kit, hsn.com). Keranique’s main treatment is a 2 percent Minoxdil solution that is applied to the scalp daily for a minimum of three to four months. Another new but less expensive option is Clear Scalp & Hair Therapy Total Care system which includes a Volumizing Root Boost Nourishing Shampoo and Conditioner ($5 each at amazon.com). One of the latest treatments is Sunetics low level laser therapy available at dermatologist and plastic surgeons’ offices. The lasers work to increase blood flow to the scalp and increase circulation, which in turn assists with hair growth and volume. If you cannot make it for a professional treatment, you can try their Laser Paddle Brush at home instead ($780, more information on where to purchase at sunetics.com). Is your hair dry and lifeless? Wander over to the kitchen and concoct a remedy.